Specially devised by former World Cup star and UEFA Pro Licence Coach, David Campbell, the Schools Programme is for boys and girls aged 4 – 16 years of all abilities. From absolute beginners to future football stars, the programme is available directly after school, during school, at lunch time or as a breakfast club. 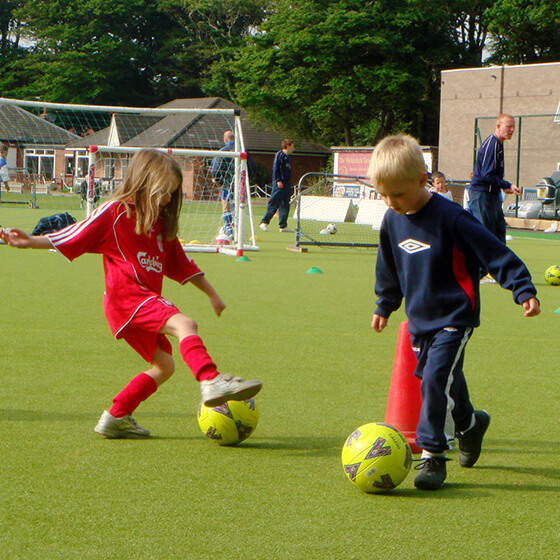 Children are coached within their own age group / ability and are encouraged to understand the principles of the game, allowing them to develop safely while ensuring correct techniques are learned right from the start. Sessions are fun and will help to improve fitness, team building and other life skills. Each 20 week course consists of a 1 hour session each week and includes warm-up / cool down, coaching techniques and skills, plus a fun match at the end of every session. The cost is equivalent to only £4 per session (£80 for 20 weeks) and can be paid securely online using credit / debit card or Paypal. Occasional we also run shorter courses at select venues. Courses are available on an on-going basis throughout the year and take place at a child’s own school. Operating at numerous venues (principally throughout the North West of England and Northern Ireland) including Liverpool, Wirral, Warrington, Runcorn, Ormskirk, Manchester, Preston, Lancashire, Cheshire, Belfast and many more. Schools can also request to host any of our popular courses by completing an enquiry form.